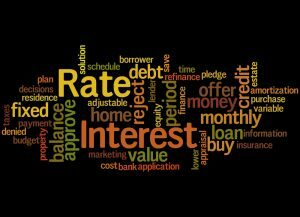 Home » Blog » Blog » What is the difference between a fixed and adjustable interest rate? What is the difference between a fixed and adjustable interest rate? If this sounds like a mouthful, we’re with you. The chief difference between fixed and adjustable rate loans and mortgages is that, with a fixed rate loan, the interest rate you pay never changes. With an adjustable rate, the amount of interest can fluctuate, and so can the monthly payment. Deciding which is best for you can be a difficult endeavor, but with our mortgage tips, you can get a better idea of which type of loan is the right choice. A fixed-rate mortgage is the most popular type of mortgage for new home buyers. With a fixed-rate, your interest will stay the same for the life of your loan. Most lenders offer the convenience of 15-, 20- or 30-year terms to pay off the mortgage. Even though the payment is slightly higher on a fixed-rate mortgage, it is a popular choice among homeowners because the interest never changes. With similar terms such as 15-, 20- or 30-year terms, the difference between ARMs and fixed rate mortgages comes down to the way interest is calculated and whether that changes over the lifespan of the loan. There are several different types of adjustable rate loans. Curious to know how much you’d pay on a mortgage? It’s easy to estimate with our free mortgage loan calculator. The stronger your current credit and financial history, the more options you’ll have when it comes to choosing the right loan. For buyers with poor credit, the options are limited and often mean higher interest rates and less-than-favorable terms. If you’re considering applying for a mortgage or loan, keep these tips in mind before you submit your application. To better your chances of getting a lower rate, do what you can do reduce your debt and your debt-to-credit ratio. If you’re currently dealing with a debt problem that feels too difficult to solve on your own, CreditGUARD has answers. Our certified credit counselors can help you better understand your financial situation and how to move forward toward a better financial tomorrow with less debt! Call CreditGUARD Today!